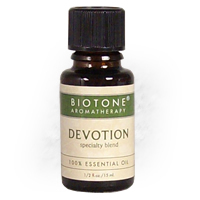 Biotone Devotion Essential Oil Blend is 100% Pure. Blend of Clary Sage, Patchouli and Orange essential oils. A romantic, uplifting scent.